FEATURING - Adorable Pink and yellow Butterfly, white polka dot ad for lovely style. A MUST HAVE: Timeless rain boots are available in perfect neutrals and vibrant, fun prints; perfect for year round wear! WATERPROOF RAIN BOOT | Our Western Chief Women's Printed Tall Rain Boots are made with rubber, which is waterproof and durable. The handmade vulcanized construction prevents weak spots in seams and allows us to make our fun designs. COMFORTABLE INSOLE | We know standing on your feet for extended periods of time can be hard so we use comfortable EVA insoles in our boots. The insoles are removable, making them easy to clean and replace. MEASUREMENTS | The circumference is 14.5" estimated. The shaft is 1.75" estimated from the arch. The heel is 0.75 inches and the platform 0.25 inches approximate. 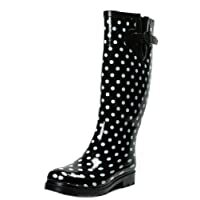 Design: Blue Polka Dotted Rain Boots w/ Lining. Great design throughout the boot. Your kids will love the design. Material: High Quality Rubber Material. Use: Waterproof Design will keep feet dry. Let your kids go puddle jumping without the fear of getting wet. Great to wear out in the rain or snow. Feet will stay dry and warm. Comfortable, Stylish, and Easy to Wear. These are pull on's with no Zipper. Easy to put on and take off. Full year use. Boots can be used during all seasons for Rain, Snow, Dirt, and Mud Play. Comfortable enough for long walks and rugged enough for tough play. Measurement (tested sz 11; approx. ): Heel 0.75" Shaft (w/heel) 7.25" Opening 10", True to size, Brand new with original or Alrisco shoe box. 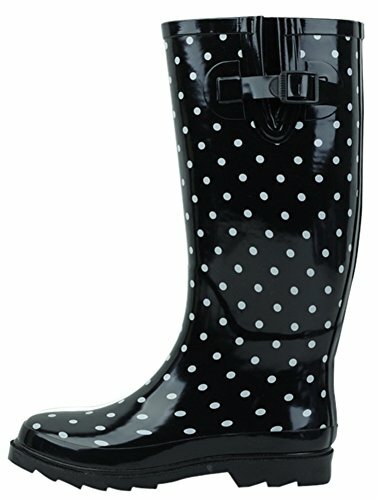 Rubber Boots Woman Lined Low Short Rain Shoes Waterproof Polka dot Zipper Wedge Sole Skeleton.Updated honeycomb wedge heel 2.36" design,light weight with better drainage.Shaft measures approximately 9.06" from arch. Measurement (tested sz 11; approx. ): Heel 0.75" Shaft (w/heel) 8" Opening 11", True to size, Brand new with original or Alrisco shoe box. Our Size Label: US Size 5= European 37, US Size 6= European 38, US Size 7= European 39, US Size 8= European 40, US Size 8.5= European 41. Design: Pink and Red Polka Dotted Rain Boots w/ Lining. Great design throughout the boot. Your kids will love the design. Lightweight, waterproof upper made from rubber. It's a synthetic rubber that's designed to retain its flexibility and traction in both warm and cold temperatures. Rain boots for wear in rain and mud. For fall and winter use, warm socks are recommended. Cotton Lined. Vulcanized natural latex construction provides a seamless waterproof shell;Rubber outsole offers traction in wet conditions. Measurements: Shaft measures approximately 14" from arch; Heel Height: 1 in; Circumference: approximately 15". Dazzle in these beautifully chic rain boots this rainy season! This rain boot from Bogs features a grippy tread and vibrant personality. The boots also come with a perfect travel bag!